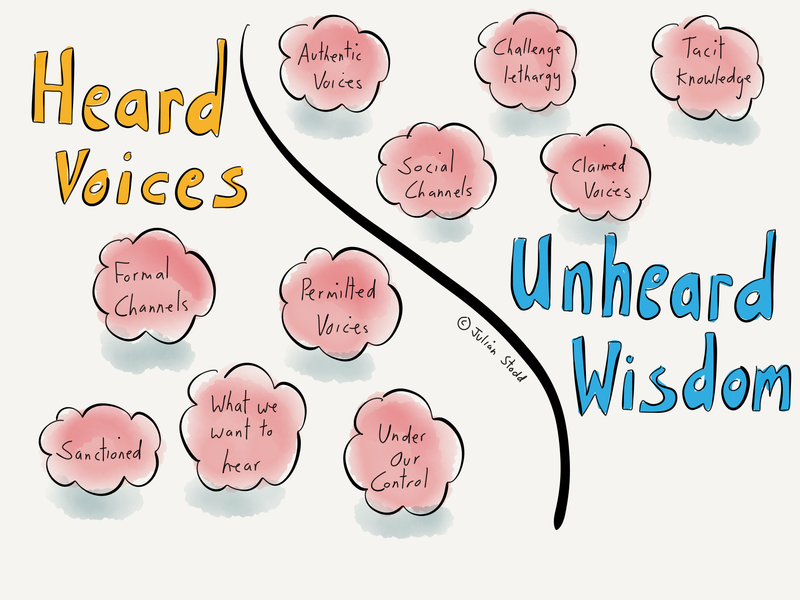 If we just listen in the spaces that we know, we will just hear what we’ve always heard: is your organisation brave enough to listen to the unheard wisdom? Often organisations are obsessed with how to control the conversation, to own the story, but the cost of that can be that they never get to hear what’s truly being said. Think about the heard voices, voices that come through formal channels: permitted voices of consensus and agreement, often saying what we want to hear or allow them to say. Voices which operate under our control, sanctioned to say what it’s safe to hear. Then think about unheard wisdom: voices with no permission, voices that are silenced through formal repression and moderation. Think about the tacit knowledge within the community that truly knows what it’s talking about, and whether we are in the right conversations to hear it. The claimed voices where there is no permission: voices of protest, or conscience. What do we miss if we fail to even listen to them? Voices that may carry great authenticity. There are so many voices, it’s naive to think that only our formal ones have value, command respect. For the Social Leader, we need access to all these conversations, to listen with respect and form our own opinion. Preventing people hearing the story does not make it any less true. This entry was posted in Communication and tagged Authenticity, Leadership, Permission, Protest, Silence, Social Age, Social Leadership, Voices. Bookmark the permalink.